Often times, first-time homebuyers go into the process blind. They have absolutely no idea where they want to live or what is their most important feature in a home. Considering these questions up-front is important. Having some specifications and ideas of what you want will make the process less stressful and time consuming for you. If your Realtor® knows what you want, they can go through and weed out homes that do not meet either all, or a couple of your specifications. This is your home-buying journey – it’s important that you make it as enjoyable as you can! Also, this is your investment, with your hard-earned money, so make sure you are looking at homes that are exactly what you are looking for. Familiarize yourself with how much buying a home will cost. Think about your financial future and your retirement. If buying a home will put a big dent in your future plans, then it may not be the right move yet. Make sure to plan your monthly budget carefully and factor in what your mortgage payment will be at a given price point, and stick to that price point. While choosing to invest your money in a home is smart, it is only a smart decision if you can afford to make the investment. Nevertheless, if you do feel like it might be the right time to make this big decision, consider answering the following questions. It will make your home-buying journey more enjoyable and will help you and your partner decide what you’re looking for! 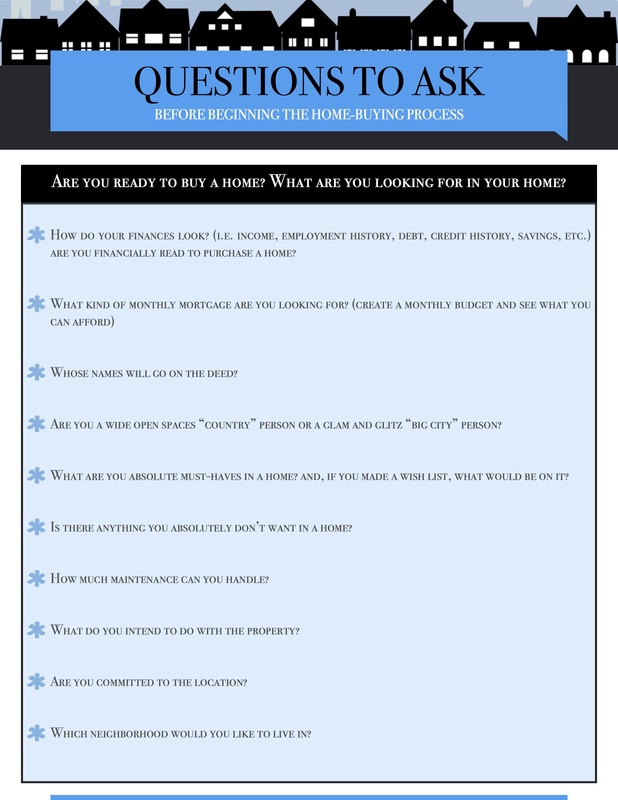 Contact me anytime with questions about the home-buying process. I’m always here to help.